MANILA, Philippines -- The lucrative K-pop entertainment industry continues to draw hopefuls who all dream of becoming the next Big Bang, Super Junior, BoA or 2PM. 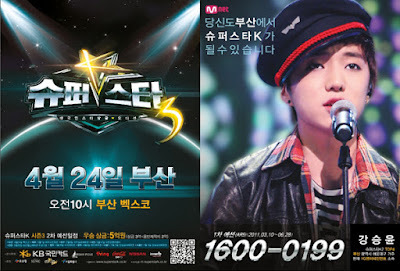 As of April 19, 1.36 million people have so far auditioned as contestants for “Superstar K3”, Korea’s version of “American Idol” which is now on its third season. The number of applicants this year has surpassed two records set by the first and second seasons of the talent search show. Cable TV channel Mnet, which airs “Superstar K”, said auditions for the third season began last March 10 and in the first day alone, 50,000 people applied to become contestants. In 50 days, it has already exceeded the 1.346 million applicants recorded in the second season. When the show was launched in 2009, more than 700,000 singer wannabes applied. Mnet predicts that by the time the auditions end on June 28, the show expects to receive more than 2 million applications. The first episode of “Superstar K3” will air on Aug. 12. The winner of “Superstar K3” will be determined based on online votes (10 percent), judges’ decision (30 percent) and text message votes (60 percent). Last year, 25-year-old repairman Huh Gak won the “Superstar K2” title, defeating Korean-American John Park in the final show.